As a rider, you understand that the rein attaches to the bit so you can communicate with your horse. The type of reins you use need to match your riding style. Choosing the right reins can make a difference in how your horse rides or how effective you are in competition. English reins employ a fairly standard design. Most English bridles come with two reins that buckle onto the bridle on either side and then buckle to each other. 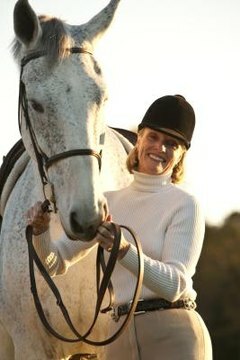 Some reins are designed to be softer or stretchier. English reins may feature plaits, braids or flat laces that help prevent slippage through your hands. Split reins are commonly seen in Western pleasure or Western horsemanship competitions. The reins do not attach to one another unless you tie them in a knot at the end, which some riders do. Flat and smooth, split reins are normally 6 to 8 feet long. Western closed reins are made from a single piece of material -- leather, rope, nylon, polyester or other materials. They attach to the bit on either end and loop around the horse's neck. They are commonly used in rodeo and working cattle events because they will not fall underneath the horse or get tangled if they are dropped. They are shorter than split reins. Romel reins are a variation of the closed rein, except they have a quirt attached that can be used for encouraging a horse to move forward. The special mecate rein is only used with a bosal hackamore bridle. Made of rope or horsehair, mecate are fastened to the bottom of the bosal, wrapped around the horse's neck and then re-attached using a special type of knot.